In response to requests in the recent post ‘Classics that never get used’ here are five essentials of a modern wardrobe. Obviously a man’s actual requirements will vary hugely by lifestyle and occupation, but hopefully there will be something here for everybody. On reflection I decided to make this piece about jackets and tailoring. The rest can take up a future post. You will find examples of the pieces I describe at the various links below. Some say grey compliments more complexions. They are probably right; but navy is more versatile. No matter what you job or place in life, you will find a use for a great navy suit. Get it in a mid-weight (around 13oz) so it can be worn most of the year. Get two pairs of trousers and consider adding a waistcoat: a waistcoat and trousers can be a very practical (not to mention stylish) option for day-to-day office wear. And look after it so it lasts. This should be soft, both in material and construction. For bespoke, this means Neapolitan: a shirt-shoulder, a shorter length, curvy patch pockets. To be really useful, it has to be equally at home with flannels and denim. And you don’t get that with any kind of structured shoulder or chest. Mid-grey is the most versatile colour for a sports jacket, preferably with some texture (herringbone, Donegal). Until recently I had been making do with my Permanent Style Tweed model from Caliendo. Now I finally have a cashmere version in the works. Flannel is a wonderful cloth. Elegance and comfort are not combined to the same degree in any other material. And a mid-grey flannel suit will be a fantastic foil to that navy worsted. Not for all-year-round, but as a characterful but perfectly professional option in the mild or chilly months (see top image). Buy two pairs of trousers, again. Perhaps even three: one to give the suit longevity, another to be worn on its own. No, hang that. The third should be in a paler grey. I do love pale-grey flannel. The tailored man’s denim. You need an overcoat, so this is a rather obvious choice. But given that necessity, it is worth working to buy one that is at least equal to the rest of the wardrobe. And work hard on getting a fit that works with both suits and knitwear. Obviously easier if you go bespoke. For style, I’d recommend navy, possibly double-breasted. There is much joy in the line and drape of a DB, and an overcoat is the easiest way to wear it. The classic casual jacket, a blouson sits on the hips and zips up the chin. Unlike a leather jacket, it often blooms at the waist, though does not have to. I have two favourites: unlined brown suede from Carlo Brandelli’s first run at Kilgour, and pale-grey cashmere from Loro Piana. They are more prevalent in cotton, but search out one in wool or suede. To be worn at the weekend with those flannels and old brogues. Also great for travel. You can follow the discussion on The staples of a good wardrobe by entering your email address in the box below. You will then receive an email every time a new comment is added. These will also contain a link to a page where you can stop the alerts, and remove all of your related data from the site. Great post, solid advice, thank you. But, the ‘mid-grey flannel’ suit link isn’t working, I’me interested to see what you recommend as I’m in the market for one. It’s actually trying to link to the image at top. Gotcha, that suit’s a beauty, thank you. PS does have plenty of info, your site is a daily read for me and brilliant resource. I’ll probably go down the Graham Browne route. Great post, solid advice, thank you. But, the ‘mid-grey flannel’ suit link isn’t working. I am interested to see what you recommend as I’m in the market for one. Why do you think mid-grey is a versatile color for a sport coat? What would trousers would you combine it with? Mid-grey flannel trousers (to me THE smart casual trousers) won’t work with it. Good idea. Oh, and I forgot: Thanks for this article, really helpful. My comment sounded a lot ruder than I intended! Hi Simon, just wondering what cloth weight you would recommend for the sports jacket? I will be wearing the jacket Autumn to early Spring (substituted by linen in the warmer months) but find that with each year that passes tailors are offering lighter weighted fabrics. Can you help please? Many thanks for this timely post. I’ve read it with great interest! From time to time, a post on what you consider as an ESSENTIAL might be helpful too. Hi Simon. Do you know who made the suit pictured above? I really like the look of a suede A1 blouson but given the English weather I think I would anxiously scan the sky for clouds whenever i wore one. Simon, when it comes to suit texture which would you consider to be the top 5 business staples? Are there some textures/patterns which work better with certain colours – navy herringbone, grey pick and pick for instance? I’ve recently been debating where to diversify after the core navy and grey worsteds. Thanks Simon and good point. Would it be safe to say herringbone, birdseye, and pinstripes are all suitable alternatives to plain worsted for a conservative office in the City? Interesting list. Having spent February in Aarhus, Denmark without an overcoat – getting by with a felt-lined trench; I would argue that most people don’t actually *need* an overcoat. Obviously they are lovely, but one overcoat will take quite a beating over the 2-4 month period you might use it – so you need a 2nd coat of some kind, be it a pea coat or another overcoat, and that’s potentially a serious investment. Consider the lined trench. My worry is that it would be too risky to deviate from house style: better to get something more standard, use suitsupply, or save up for GB. What are the details you’d need to request in order to get a soft, casual jacket like that from a cheaper tailor? What mistakes are most important to look out for? Simon…do your business suits have straight pockets or slanted pockets? Ticket pockets? Happy New Year. I wonder if you could help me with a couple of sartorial questions, please? They are separate issues but I thought I would lump them together here for ease, if you don’t mind? Firstly, I intend to push the boat out later this year and purchase my first bespoke suit. Apart from some military uniforms made for me in a previous life, I am a bespoke virgin and so would appreciate a steer towards an appropriate ‘house style’ for my body shape? I am in my fifties, 5′ 8″ tall with a very broad chest and big shoulders. I am quite slim in the waist but have quite short legs for my height. Indeed, I was once described as a ‘tailor’s nightmare’ when purchasing my first interview suit in my teens, so I know I am not a natural for looking good in a suit! Nevertheless, I am going to go for a simple two-piece, SB, one or two button navy blue etc but perhaps in a really nice cloth, as this suit won’t be for work, just weddings etc a few times a year. However, I am unsure whether my shape would suit a structured coat ( in which case, I am tempted by either a de-tuned C&M or perhaps a Richard Anderson) or whether I would be better off in something ‘soft’ ( in which case, I would favour either A&S or perhaps Caliendo). Anyway, I would appreciate your thoughts when you have a mo? Secondly, my dear wife very kindly bought me a Brioni linen shirt for Christmas. It is beautiful, exquisite in fact but unfortunately it is yellow! Come the summer, I will have to work out some way of wearing it! How on earth can I put together an outfit that looks good, based around a yellow shirt?? Please help! 1 – I wouldn’t say either would particularly suit your body shape. A more structured look might emphasise your strong upper body, but that’s about it. I would go into both and ask their advice, make it clear what choice you are making. I really like lemon yellow shirts, which work well with green and navy imo but a stronger yellow is definitely tough to work with! I was under the impression that burgundy or similar colored shoes (I have one pair with a great patina, in the cordovan color, not the leather) were, in fact, the most versatile of all shoe colors – that they could be worn with khaki, gray, navy, and black. Simon, your thoughts? Considering expanding my shoe wardrobe from the aforementioned and black cap toe oxford to a punch cap burgundy oxford. Thanks for your thoughts. What prompted your move from light grey to mid grey as the most versatile jacket? In older pieces, you generally say go for light grey jackets if you want something casual and versatile (or navy if more formal). I am slowly trying to build my business wardrobe. I will very soon start to work at a law firm where almost everyone wear suits or sports jackets, but only a few wear ties on a regular basis. I am planning to wear a tie, however. What would you recommend to be my next purchase? And then maybe a new suit. Any recommendations? I’d go for the grey fresco trousers next. 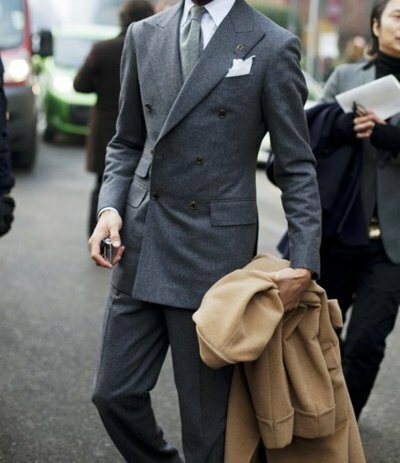 Then for a brown herringbone cashmere jacket, then some tan trousers…. Hi Simon – how would you modify this for warmer climes like Hong Kong and Singapore where grey flannel isn’t a great option for most of the year, cashmere is hard with humidity and an overcoat is less needed than it is in the U.K.? Trying to decide what sort of jacket to have made while solito is in HK – donegal tweed vs cashmere herringbone etc and what would work better in this weather? Look up some of my summer jackets – plenty of options there. Or I can do a longer post if that would be helpful? Thanks Simon, yes I saw your oatmeal caliendo and the hop sack as well. A longer post for managing with lighter fabrics in warmer (and more humid) climes would be very useful. Simon, if you could have 1 or 2 pairs of bespoke shoes, what colour/design would you go for? I’m thinking dark brown annonay calf full brogues – or would you go for less brogueing? Trying to think of versatility. I’d have a mid-brown and a dark brown, one plain oxford one half brogue probably. Hi Simon, I’ve been following your blog with great interest. I have a question about the essential suits one should own. I am not a bespoke buyer (I hope to be, with time, to save towards investing in a good suit) or even MTM. I buy RTW suits, but get them altered. I work in fundraising, in an assistant role, and I don’t have to wear suits to work every day, but the work atmosphere is professional, tending towards business casual (slacks with a Charles Tyrwhitt shirt with or without a tie, and when chilly, a sweater or jacket, or suit with or without tie. It’s not banking). At the events with large donors, a classic suit is necessary and appreciated. At lesser events, something smart or less formal is required. I am also exploring mixing and matching tweed and jeans, or tweed trousers with knitwear, etc., on the weekends. My question is, what are the essential suits to own? I own a worsted 100% light wool (good in winter or summer) , dark navy blue, from Atelier Torino in Germany, perfectly altered, and it looks great: not too slim fit, and not too “1990s baggy” or boxy. My wedding suit is from Billy Reid, an American designer, and is a dove grey, similar to the post you did on your friend’s wedding, but with “western collars,” which give it a less formal quality. Again, perfectly altered to fit me, and informal enough to wear post-wedding. I also own a navy blue Japanese seersucker from Jcrew which is great in the summer (both the grey and the seersucker are a bit too tight currently); and a brown tweed three piece suit from Magee in Ireland. I also have a 1960s Magee tweed blazer in a mustard tweed that my father handed down to me. In overcoats, a navy blue Crombie style overcoat from the 1980s to below the knee; and a camel top coat to just below the knee. Is there anything I should be looking out for in terms of the next suit? Thanks so much, David. Lots of interesting questions and areas there, but in terms of suits I would say the obvious next one is a dark grey or charcoal. Nice and sharp, formal but sufficiently different to what you already have. You couldn’t comment on that post? Or to the precise comment on this post? What happened when you tried to? Thanks again, Simon, great tips! I’ll look around the vintage shops in New York City, where I live, for a good check in those colours. About commenting – I was trying to reply to your reply to my original comment, but there wasn’t a place for me to hit reply, I just was able to hit “Add Your Comment” at the very top of the Comments section. Maybe it’s because I’m not logged in? Or because I’m not a subscriber to your newsletter? In any case, thanks so much, David. Hi Simon, I thought I’d follow up to thank you for your tips. Instead of a blazer / sports jacket, I decided on a RTW two piece heavier flannel suit from Irish designer Magee. It’s not exactly navy, but a dark blue, with nice lighter grace notes from the flannel weave. As you’ve noted in your piece about flannel, it inhabits that sweet spot between casual and formal. I’m also enjoying my brown Donegal tweed RTW (also Magee) three piece, which has nice chalky touches in the brown. I’d be curious to hear what you think, if anything, of Magee. Anyway, thanks for the tips.